Which Keyboard Layout Is Faster Than The QWERTY Configuration? Although we live in a modern age of advanced electronics and lightning-fast computers, the most basic of interfaces, the humble keyboard, dates back to the 1860s. The first mechanical typewriter patent was filed in 1867 by Christopher Latham Sholes. The first typewriter had two critical flaws. The first: if two keys in close physical proximity were struck rapidly by a quick typist, the machine would jam up. Second: the current line of type was hidden by the paper carriage, so jams and errors could only be discovered by either raising the carriage or happening upon the error after an entire line of text had been typed. Sholes experimented with various letter combinations to resolve the jamming problem. By 1870, he had refined the keyboard layout to something that would be recognizable, albeit slightly jumbled, to a modern typist. In 1873, James Densmore (Sholes backer), successfully pitched and sold the manufacturing rights to E. Remington and Sons. They accepted the design and made a few minor adjustments, which included shuffling a few keys into what we now recognize as the modern QWERTY keyboard along with introducing lower and uppercase letters accessible by a shift key. Although Sholes and Remington had solved the problem of jamming keys (a strictly mechanical problem), they did it in a most impractical way. They spread frequently used keys out in such a fashion as to both keep those keys from binding up the physical arms in the typewriter and to reduce jamming. Some 60 years later, in the 1930s, another keyboard designer came along. Dr. August Dvorak—seen standing in the photo here—and his brother-in-law, Dr. William Dealey, were dismayed with the poor design of the QWERTY keyboard layout. They had studied the QWERTY keyboard and compiled a list of its shortcomings. They noted that many letter combinations required awkward finger motions, many common letter combinations required a finger to jump over the home row, many common letter combinations were typed with one hand, and most of the typing was done with the left hand. In addition, 68 percent of keystrokes involved moving away from the home row and unnecessarily stressing the hands while slowing the typist down. To alleviate these problems, the Dvorak keyboard adheres to a set of design principles that include: the arrangement of letters to maximize the alternating use of hands, the most common letters and bigrams are the easiest to type (70 percent of the keystrokes on a DVORAK keyboard are on the home row as opposed to 32 percent on a QWERTY keyboard), the least common letters are on the bottom row, the right hand should do more of the typing because most people are right-handed, and finally, common typing patterns flow from the outer edge to the center of the keyboard. Why from the outer edge to the center? Tap your fingers on the closest surface. Most people naturally tap their fingers from little finger to index finger, Dvorak and his brother were sticklers for maximizing efficiency and they tried to incorporate every strain-reducing and speed-increasing trick into their keyboard layout. The brothers filed a patent for the DVORAK keyboard in 1936. Despite the increase in speed, the decrease in stress injuries, and the overall increase in efficiency, the DVORAK keyboard failed to catch on for a variety of reasons. Dvorak and his brother introduced their keyboard layout during the Great Depression when businesses could ill afford to overhaul their typewriter inventories (or afford to retrain their staff). 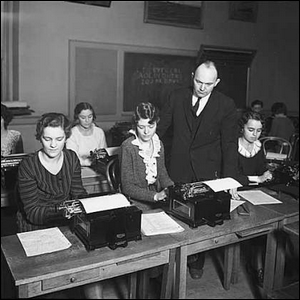 World War II was right around the corner and most factories were retooled for the war effort (including typewriter factories). And, naturally, there was an overall resistance to adoption by typists already fluent in the use of the QWERTY keyboard. No amount of efficiency can make up for resistance to change, and at this point, the QWERTY keyboard—quirks, inefficiencies, and all—is the reigning standard. Image courtesy of the University of Washington Museum of History & Industry Photograph Collection.